VR is going after the Baby Boomer market and it’s worth taking a look. Move over, millennials. Virtual reality (VR) is working its way into senior care facilities nationwide. Using technology developed by Rendever, senior adults can travel the world. From a piazza in Rome to the house left behind, technology is allowing older adults to access parts of the globe they’ve never seen, or never thought they’d see again. As highlighted in the sidebar, VR headsets and experiences vary with cost. You may be wondering how VR differs from a panoramic movie or 3D movie experience. Sensors in higher-end virtual reality headsets (such as those used by Rendever) track your head and eye movements, allowing you to interact with and navigate through different environments as though you were actually there. You become more of a participant than a spectator. To find places where you can try VR technology, click here. One such spot that is widely accessible is your local Best Buy technology store. Rendever was developed to provide cognitive therapy and track movement data to aid in early diagnosis of dementia. The company, a Massachusetts Institute of Technology (MIT) startup, won a $25,000 grand prize at the 2017 MIT Sloan Healthcare Innovations competition for its work using virtual reality for a new population: seniors. “We’re using virtual reality to improve the way we age, so you don’t become isolated, don’t become depressed, and you can keep your mind happy and healthy,” says Lally, who launched the startup with classmate Reed Hayes. But perhaps the most important function of VR is to connect families with their loved ones, Lally says. How Much Does VR Cost? 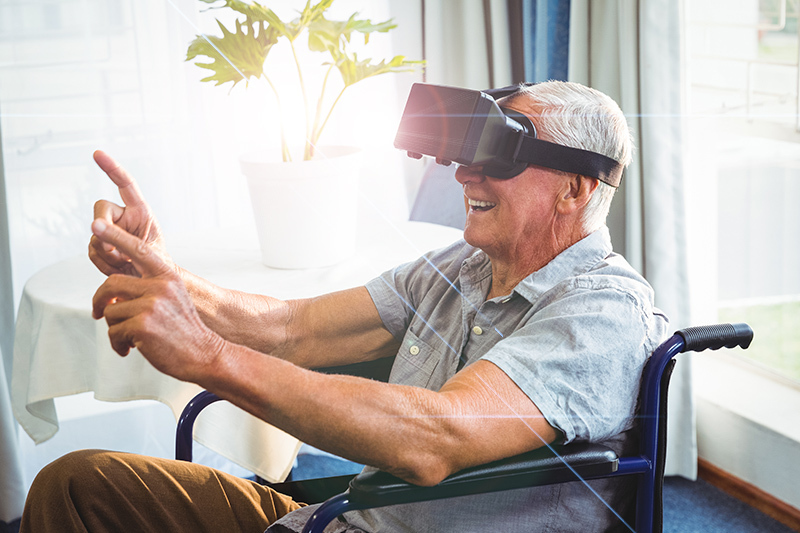 Senior care facilities can take advantage of some VR companies’ subscription services, but how much does a private individual need to set aside to purchase a VR device? Senior Spirit takes you through some of the most common options, from the priciest to the least expensive, priced on Amazon. This premium system features a headset packed with sensors, a display for each eye and integrated headphones. A camera adds movement detection information. Requires a high-spec PC to run. Similar to the Oculus Rift, HTC Vive requires a powerful PC to run. However, HTC Vive differs from other VR systems in that it allows the user to roam around a room with the aid of wall-mounted sensors. Great for seniors with a lot of mobility and a dedicated room. The headset integrates a range of sensors, and requires headphones to complete the system. While the result is phenomenal, placing the sensors can be tricky. Sony’s PSVR is an accessory for the PS4, PS4 Slim and PS4 Pro PlayStation models. The headset alone is $399, so if you already own a PlayStation, this is a less-costly alternative to the Oculus Rift or HTC Vive. On the downside, screen resolution is lower. It tracks movement of your head and uses the PlayStation camera and controller to present the VR experience. The Samsung Gear system is made to work with a Samsung smartphone, with the handsets sliding into a tray. The latest offerings feature high-resolution displays and slick visuals. Check to make sure the VR system you buy will work with your model of Samsung smartphone. Some come with an adapter to make various models compatible. Daydream is the next-generation VR product from Google after the Cardboard concept, below. The Daydream requires a smartphone such as the Google Pixel or Pixel XL, but includes a remote in the box. More phones, like the Moto Z, are adding support for this growing platform. The Daydream’s great advantage over rivals is comfort. Instead of hard plastic, you’ll find cushiony material and a wide range of content. Unveiled in 2014 as a cardboard container that could hold a smartphone, the Google Cardboard has two virtues: First, the hardware cost is minimal, and second, it’s universal, supporting a wide range of smartphone models (virtually any that fit). It allows you to sample VR content with a minimal investment. As of 2016, Google reported more than five million had shipped. There is no head strap. Users hold the Cardboard to their face to view content, which is presented via a range of apps. You can also view 360-degree environments such as Google Street View to let seniors see their old home. He should know. Lally is close to his grandmother, who is confined to her home. When he left for college, he called her regularly. But he realized that she was having a hard time focusing on the present with no visual interaction. Today, Rendever can record a family event digitally and create a virtual experience for members who are unable to attend. Lally will share his wedding in Greece with his grandmother, who can feel like she was present at the event. Although there’s been a lot of recent research in VR, little has been geared toward older adults. But findings from related studies can help predict the impact of virtual reality on seniors. For instance, researchers know that when Alzheimer’s and dementia patients listen to music from their youth, it jogs their memory. A Stanford University study revealed that VR simulations directly influenced how people behaved in the real world, even after the headsets were removed. And UCLA neuroscientists discovered that a different part of the brain is engaged when responding to virtual reality versus the real world, raising more questions about how VR might affect memory. "Everyone talks about VR as a millennial thing," says Jake Kahana, a New York-based designer and film director. "But seniors are the fastest-growing segment of the population, and there really weren't that many people looking at how this could work for them." Kahana’s difficulties communicating with his grandmother pushed him to develop BettVR With Age, a series of films he created after extensive field work talking to seniors about what they wanted from a VR experience. To his surprise, it wasn’t the sweeping grandeur he was used to shooting. The older Americans he spoke with missed simple, everyday activities they could no longer manage: museums, concerts and tours. With headsets and phones donated by Samsung and software by Rendever (see above), Kahana directed 10 films. In one, viewers listen while a violin duo plays for friends in an apartment. Another features a tour and concert at a Lower East Side museum. The simple, evocative films will be donated to DOROT, an organization for progressive social change, to use for senior programming. They’re already making an impact on Craig Palmer, a 78-year-old confined to his apartment for the last four years. A former singer and performer on Broadway, Palmer spends his days in a wheelchair, watching soccer games and listening to showtunes. Aloha VR is “designed to engage with seniors with various unmet psychosocial needs,” says Dr. Sonya Kim, founder and CEO of One Caring Team. She developed the organization to help seniors build relationships and give caregivers support through phone calls. But while she was giving a talk at an assisted living facility, a man asked what he could do to help his mother, who had dementia and couldn’t participate in a call program. Kim researched options and discovered VR technology. She tested it on some of her own patients and saw amazing results. "There are over 100 clinical research papers that are already published that show proven positive clinical outcomes using VR in managing chronic pain, anxiety and depression," Kim says. "And in dementia patients, all those three elements are very common." “For Senior Citizens, the Future of VR Lies in the Past,” Mary Pilon, April 2017, Wired. “Seniors Welcome New, Battery-Powered Friends,” New York Times. “Virtual-reality system for the elderly wins health care prize,” MIT News. “How Virtual Reality Helps Older Adults,” Next Avenue. “Virtual Reality Aimed At The Elderly Finds New Fans,” NPR. “Can a virtual reality game make you forget you’re in pain?,” The Conversation US, Inc.
“Meet the Team: Dennis Lally,” Rendever. “Presence and Memory: Immersive Virtual Reality Effects on Cued Recall,” Stanford Edu. “Impaired spatial selectivity and intact phase precession in two-dimensional virtual reality,” Nature Neuroscience. “Virtual reality doesn't mean what you think it means,” CNET.